This is a short story because I have a short attention span — and although I am not a millennial, I like to love new products and leave them. I fell in love with Daily Harvest’s cute website and offer of health. I liked that unlike Green Blender’s chop-and-blend proposition, all I had to do was add liquid, blend and go. The first week, I had one every morning. I even lost a pound. The second week, I drank three smoothies. I began to notice how loud my blender was, especially when it got stuck on a big piece of fruit and started to smoke a bit. I worried about whether the noise was waking my neighbor on the other side of the wall. I gained my pound back. By the third week my freezer was storing one smoothie and two soups from week two, plus six new smoothies. I took one of the two soups to work for lunch. I forgot to put it in the freezer and after it sat on my desk for two days, I tossed it in the trash and went out for a cheeseburger. By the fourth week, my freezer held one soup and three smoothies from the previous weeks, plus six new ones. And that’s when I decided to pause my weekly delivery for a month. A month later the eight cartons are still in my freezer. I really liked them, so why are they still in my freezer? Because they weren’t something I could just grab and go to work with. Because I would rather sleep the five to 10 minutes it took to lug the blender out, listen to it grind away (I didn’t want to buy a more expensive blender), and then clean up. Because I never found any straws in my box, so I had to search for the straws my husband found a better storage spot for (one time I was forced to go through the recycling to reuse the straw from my Big Gulp). Because I was ready for something new. 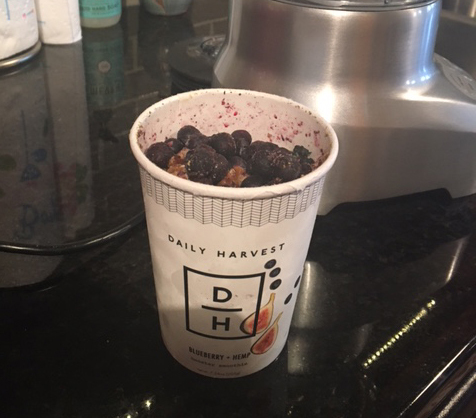 Daily Harvest tried to keep me involved through emails on how to make smoothies into ice cream and alcoholic drinks. They even taught me to “shiggle,” which is to move the blender around (ie jiggle) in order to keep the motor from overheating. I was shiggling long before they taught me, I just didn’t know the term. So when you read news stories about why it’s costing subscription services so much money to recruit new subscribers because they’re not holding on to their old ones, that’s because it’s hard to become an old subscriber when you have a short little attention span and the next best thing already is at your door.